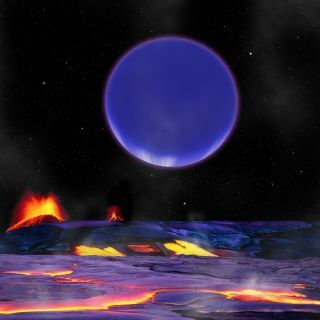 An artist's conception shows the newfound alien planet Kepler-36c as it might look from the surface of Kepler-36b. It is science fiction made fact: Astronomers have discovered two alien planets around the same star whose orbits come so close together that each rises in the night sky of its sister world like an exotic full moon. The newfound planets are 1,200 light-years from Earth and an unprecedented find, researchers said. They differ greatly in size and composition but come within just 1.2 million miles (1.9 million kilometers) of each other, closer than any other pair of planets known, according to a new study. One of the newly discovered alien planets, called Kepler-36b, appears to be a rocky "super-Earth" 4.5 times as massive as our planet. The other, Kepler-36c, is a gaseous, Neptune-size world about eight times as massive as Earth. The two planets meet up every 97 days in a conjunction that would make each dramatically visible in the other's sky. “These two worlds are having close encounters,” said co-lead author Josh Carter, of the Harvard-Smithsonian Center for Astrophysics, in a statement. At their closest approach, the two planets are separated by five times the distance between the Earth and the moon. How such different bodies ended up in such similar orbits may be tough for current theories of planet formation and migration to explain, researchers said. The two known planets in the Kepler-36 system — which is located in the constellation Cygnus (The Swan) — were detected by NASA's Kepler Space Telescope. Kepler is staring continuously at more than 150,000 stars, watching for telltale brightness dips caused when planets cross in front of the stars from the telescope's perspective. Since its March 2009 launch, Kepler has flagged more than 2,300 potential alien planets; while only a small fraction have been confirmed to date, mission scientists think more than 80 percent of them will end up being the real deal. Kepler-36c, which is about 3.7 times wider than Earth, likely has a rocky core surrounded by a substantial atmosphere filled with lots of hydrogen and helium, researchers said. Kepler-36b, on the other hand, is a super-Earth just 1.5 times wider than our planet. Iron likely constitutes about 30 percent of its mass, water around 15 percent and atmospheric hydrogen and helium less than 1 percent, researchers said. Though they're very different in size and makeup, the two planets travel on surprisingly similar paths around their host star. Kepler-36c orbits once every 16 days, at an average distance of 12 million miles (19 million km). Kepler-36b orbits each 14 days and sits about 11 million miles (18 million km) from the star. Kepler-36b probably formed relatively close to the star, while Kepler-36c likely took shape farther out. Astronomers model large-scale migrations that can bring initially far-flung planets much closer together, but the peculiar Kepler-36 system may force some refinements, researchers said. "These models rely on assumptions that will likely have to be 'tweaked' or refined to account for both b and c's proximity and compositional differences," Carter told SPACE.com via email. "The existence of Kepler-36 may help clarify or invalidate these assumptions." Both planets are likely too hot to support life as we know it, with Kepler-36b probably sporting lava flows on its surface. They orbit roughly three times closer to their host star, known as Kepler-36a, than the hellishly hot planet Mercury does to our sun. And Kepler-36a is likely a bit hotter than our star, researchers said. The researchers publish their results Thursday (June 21) in the journal Science. A look at how the alien planet Kepler-36c might look from the surface of its near neighbor, Kepler-36b, with the Seattle skyline added for scale (right). At left, the moon looms over Seattle to give yet more perspective. Every 97 days, Kepler-36b and c experience a conjunction that brings them within just 1.2 million miles (1.9 million km) of each other — roughly five times the Earth-moon distance. This would be quite a sight for an observer on the surface of either planet. "Planet c would appear roughly 2.5 times the size of the full moon when viewed from the surface of planet b. Conversely, planet b would appear about the size of the full moon on planet c," Carter said. "We can speculate on the appearance of planet c: It may appear slightly more purple that Neptune," he added. "The purple hue owes to absorption of red and yellow by sodium and potassium. There could also be a slight brown tint owing to hazes of photo-disassociated methane." Such dramatic vistas could well be around for many years to come, researchers said, for the orbits of Kepler-36b and c appear unlikely to change anytime soon. "We are addressing this in a follow-up paper, but the short answer is that yes, these do appear to be stable on a long timescale," Agol said.